Produktinformationen "Korean for Dummies mit Audio CD"
Provides phonetic spellings of Korean words Get the basics you need to interact with Korean speakers with ease! Want to communicate in Korean? This easy-to-understand guide explains the basic grammar, numbers, and vocabulary you need to make introductions, small talk, and to get around. From ordering food and asking directions to handling money, shopping, and taking transportation, you'll see how to speak the language and be understood. Plus, you get fun exercises, verb tables, and a mini-dictionary! Start speaking Korean the fun and easy way with "Korean For Dummies", a no-nonsense guide to Korean culture and the basics of Korean language. Pick up basic phrases and commonly used words so that you can converse with Koreans in both business and personal situations. You'll learn Korean for everyday life and task-specific expressions for Korean on the go. In addition, you'll discover important and fascinating aspects of Korean culture.This handy guide won't burden you with lists of grammar rules; just look up the phrases and cultural phrases that you need or read through the whole book for a general overview. You'll be able to place material in a daily context with cultural tidbits, phonetic spelling of Korean words, and the recorded Korean dialogues on the accompanying CD. Exercises will jog your memory and reinforce everything that you learn.Find out how to: use basic phrases and words correctly; converse intelligently about Korean culture; do business with a Korean company; say task-specific expressions; pronounce Korean words; put material in a real-world context; and, make a good first impression with Koreans. Complete with lists of ten ways to learn Korean quickly, ten phrases to make you sound Korean, ten expressions that Koreans like to use, and ten things you should never do around a Korean, "Korean For Dummies" is your one-stop guide to speaking basic Korean and understanding the fundamentals of Korean culture. Chapter 1: Getting Down the Basics. Chapter 2: The Nitty-Gritty: Basic Korean Grammar and Numbers. Chapter 3: Introductions and Greetings. Part II: Korean in Action. Chapter 4: Getting to Know You: Making Small Talk. Chapter 5: Eating and Drinking. Chapter 6: Shopping Made Easy. Chapter 7: Exploring the Town. Chapter 8: Enjoying Yourself: Recreation and Sports. Chapter 9: Making Connections: Phone, Mail, Fax, and Internet. Chapter 10: At the Office and Around the House. Part III: Korean on the Go. Chapter 11: Money, Money, Money. Chapter 13: Staying at a Hotel. Chapter 15: Planning a Trip. Chapter 16: Handling an Emergency. Chapter 17: Ten Ways to Get a Quick Handle on Korean. Chapter 18: Ten Things to Avoid Doing in Korea. Chapter 19: Ten Favorite Korean Expressions. Chapter 20: Ten Phrases That Make You Sound Korean . Appendix D: On the CD. 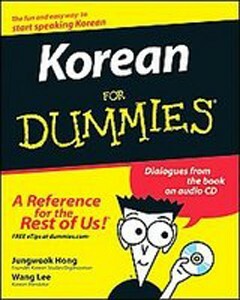 Weiterführende Links zu "Korean for Dummies mit Audio CD"
Unser Kommentar zu "Korean for Dummies mit Audio CD"
Kundenbewertungen für "Korean for Dummies mit Audio CD"